Dream jobs seem to come in bunches for watershapers: If you do the best work you possibly can, apply your education, stand by your work and, most of all, leave your clients happy, nice things that happen with one job seem to lead almost inevitably to other great jobs. That’s exactly what happened with this project: I was led to it by satisfied clients who became my best salespeople and told all their friends how delighted they were with the work we’d done and how much they were enjoying the results. By the time I actually met this new client, there was no question about us having the inside track; indeed, we just jumped right into the job’s specifics. From the start, we were given tremendous creative freedom, there was no big concern about budget and the work was all about collaboration. We didn’t need to focus on nurturing trust, because it was built into the process. All we had to do was live up to our reputation, meet expectations and produce spectacular results – and accomplishing the latter wasn’t all that difficult given the nature of the setting. The client, a successful production designer in the movie industry, is not surprisingly a person of tremendous creativity and substantial personality. His beautiful Beverly Hills, Calif., home is hidden in a deep, wooded canyon, and his ambition was to create a distinctive oasis in the midst of urban sprawl. When I visited the site, he led me over to the slope and pointed down to the very bottom of a canyon that’s part of his property. The house sits well above that level on one side of the canyon, but “down there,” he said, is where he wanted me to work. The only problem, as I saw it, was that the area he was pointing to was filled a cluster small buildings that had been placed down there through the years to serve a variety of purposes. I was taken aback somewhat, because I don’t usually approach spaces with so many obstacles in the way of my watershapes. When I expressed concern that there wasn’t much room for a pond in the available space, “no problem,” he said, because his idea was to demolish all the buildings and start with a clean slate in which a large pond/waterfall/stream composition would take shape. When I was done, he said, he would follow up and create a scene around the water’s edge. The steep terrain upon which we installed the waterfall required us to be aware of every move we made with boulders that weighed up to a ton. In a completely different way, working with the bulk of the large, one-piece liner made us aware of every other site constraint as we wrestled it into place along a roughly hourglass-shaped space between mature (and untouchable) trees. Interestingly, during this period I spoke with another local contractor who’d also seen the site who said he’d been so overwhelmed by the fact that the space was full of structures that he had no capacity to visualize things without them. Happily, I didn’t have that problem once I knew the buildings were going away. My sole adjustment was that I had to include a demolition phase within the project’s scope. And demolish we did, bringing in a big bulldozer and going to town with the structures. (In fact, I discovered a new passion: If I weren’t already deeply engaged in creating elaborate ponds and streams for a living, demolition would be another endeavor I might enjoy.) Most of the building were fairly insubstantial and fell over like houses of cards, but even so, there was something enormously gratifying about being paid to knock stuff down while knowing as well that we were clearing the decks for something beautiful. So we cleared the site, hauled away the refuse and found ourselves standing in a fresh space where the watershapes would be the first new element in what was shaping up to be a spectacular scene. But the decks weren’t completely clear: We left a number of mature Eucalyptus trees in place because the client was including them in his plans. We slowed down around the trees and took care in reshaping the space (in consultation with an arborist) to make certain we did no harm to the trees’ root systems in establishing the footprint for the pond. The thought of building a large, naturalistic watershape in the cleft of a canyon makes perfect sense, of course: The space we were working in – approximately 200 feet long by 80 feet wide – was just the sort of place you might expect a real body of water to form over time. We had to take that possibility into account in our planning, knowing we had to accommodate runoff during big rainstorms while finding a way to keep this accumulation from swamping the entire site. In this case, the solution involved installation of a three-inch overflow line attached through the skimmer: It flows directly to the city’s storm-drain system, which was accessible about 300 feet away. With that key issue settled, any other concerns we might have had about placing the pond in its intended spot simply evaporated: Everyone involved saw this as an absolutely perfect place to locate a large pond. It all made sense. The client envisioned this body of water nestled amongst mature trees in a completely private setting. He wanted beautiful water quality so he could stock the pond with an appropriate population of fish and make it attractive for swimming. He also had plans once we’d installed the watershapes to dress the area up with new structures, decks and an array of decorative touches. The pond is approximately 100 feet long by 50 feet wide (at its widest point) and is about five feet deep at one end. A large waterfall structure feeds a stream and a large, wetland-style biological-filtration area that flows to the pond, which is pinched in the middle to give wide berth to two big Eucalyptus trees. Various rock structures crop up around the pond’s edges, reaching up into the surrounding space and also extending into the water itself, where nooks and crannies have been set up to give the fish shelter from sun and predators. The biggest challenge offered by the site had to do with steep slopes, tight spaces and limited access – issues complicated by the fact that we were building a relatively large structure with a huge liner, tons of boulders and a large plumbing system. It was big work in a small space, but there was no leeway: Our client’s sole demand was that we take the space and turn it into something beautiful. From the first time I ever saw the site, I knew access would be an issue and that the job would require not just careful attention to logistics, but also a special focus on making everything seem perfectly natural. Through it all, the client trusted that we could do it – even though I knew none of it would be easy. The waterfall system was the toughest part of the job: It was located on the wall of the canyon opposite the house so the client would always be able to enjoy the drama of moving water even if he didn’t feel like venturing to the canyon’s base. The system starts at the top of the slope and drops 30 feet in elevation over a cascading course about 60 feet long: You don’t have to be good at geometry to figure out we were working on an extremely steep slope. To complete this structure, we brought in large boulders from a quarry in the nearby Santa Monica Mountains, with the biggest specimens weighing in at just over a ton. In other projects where access isn’t an issue, we often use pieces four or five times that size, but here we had no choice and had to work with the limitations imposed by the site. The set of watershapes discussed in the accompanying text is lined with 40-mil polypropylene protected by a nylon underlayment. We used the 40-mil liner because it enabled us to cover the pond’s entire 100-by-50-foot expanse with just one piece, which is always my preference because it lets me avoid seams. The sheet arrived as a bulky, 2,500-pound package, and it took several hours (not to mention lots of strong backs) to unfold it and gradually spread it into place. Once we were into it, we discovered that we couldn’t pass the liner through the narrow pinch between the trees, so we had to use an excavator to lift and twist the liner through the trees before we could finish unfolding it. We took great care to dig the waterfall channel far enough back into the slope that we were able to half-bury the largest pieces. This served the dual purpose of creating a more stable structure and of making the work look more natural – as though the rocks were part of an underground geological structure that had been exposed by centuries of erosion. We wrestled these boulders into place after we’d laid down the liner, using a large excavator to which we strapped each piece to aid us in what was a supremely laborious process. It was slow-going for good reason: Safety was a huge concern as we fought gravity and lifted large rocks up the slope, so I spent a lot of time reminding my crew to think carefully about where they were relative to the rocks as they were being moved and placed. Obviously, we never wanted anyone standing directly downslope of the boulders as they were being placed because of the risk one might break free and tumble to the canyon floor. But in a confined space with noisy machinery and hard work involved, communication can suffer. We knew this, so we carefully orchestrated every move and made sure ahead of time that everyone knew what to expect and, more important, where to be as the process unfolded. Taking our time with this boulder-setting stage of the process is, of course, second nature to us anyway: With waterfall and stream work of this sort, the placement of the boulders is what makes or breaks the look, so we always proceed with care and invariably enjoy the improvisational aspect of the work. This meant that, at several points on this job, we just stopped what we were doing, backed up and assessed what was happening from a variety of angles. This process of adjusting rock placements is the real art in rock and stream design, and if something doesn’t look quite right, we move rocks or fine-tune their positions until everything is perfect. In this case, the quest for perfection involved lots of running up to the main house to see what was happening on the canyon’s opposite face. Beyond being good exercise, reaching this vantage point gave us the literal distance and perspective we needed to approach the tasks at hand like artists. It also gave us a spot from which we were able to appreciate the beauty of the structure that was taking shape across the way. The waterfall flows into a short stream that feeds a biological filtration bog. The system is set up so the waterfall can be turned off for service, but the bog runs constantly to circulate water in the pond. The effective area of the filter bed is eight by 12 feet, with the return manifold situated beneath layers of gravel. 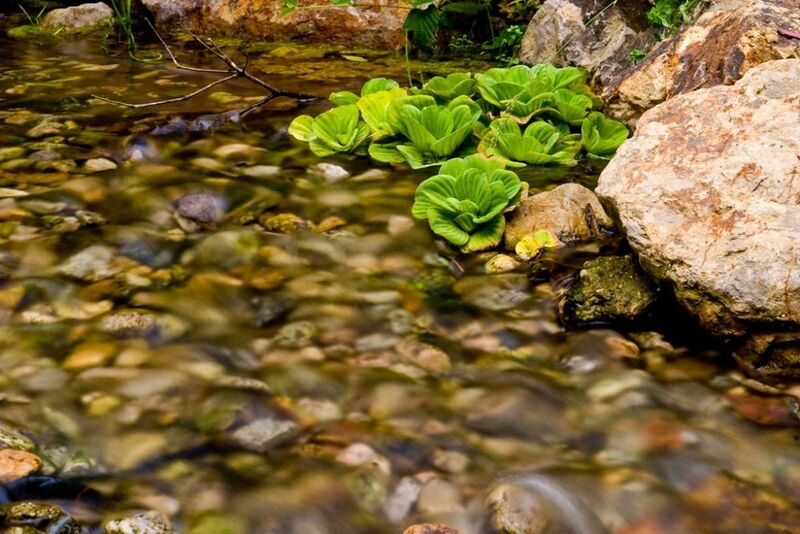 The movement of the water around and through aquatic plants is another resource ensuring water clarity, as is the fact that water that has passed through the filtration system wells up through gravel in yet another natural filtering action. When working with this approach, it’s critical that the return manifold be configured in such a way that water flows evenly and slowly through the gravel medium. In this case, we used a perforated, cross-shaped manifold that released water laterally instead of having it flow straight up. We also placed four aerators in the pond and set up numerous planting pockets to ensure maximum water clarity and superlative water quality. That crystalline clarity enhances the views available beneath the water’s surface, so we created a variety of shelves and underwater rock formations to give the pond a more natural appearance. That clarity also allows for easy viewing of the fish and makes the water quite attractive for swimming. A big part of the story here involves what the client did after we finished our work on the watershapes. As mentioned at the outset, he’s a production designer in the film industry and an immensely creative person. Even though I was prepared for something spectacular to emerge, I have to admit being surprised by the transformation that took place under his direction. First, he built a two-story structure right next to the pond with a small deck cantilevered out over the water. The building has been painted a deep red and has a variety of interesting architectural touches that evoke the Balinese style. Then he complemented the building with a series of decks, pathways and outdoor furnishings along with an array of sculptures, columns and works of folk art. Finally, he placed lanterns, torches and candleholders throughout the space to create an incredibly romantic ambience when the sun goes down. All of this brings up an interesting point. Because we worked with what was essentially a clean slate (except for the trees), we didn’t have to work around existing decks, shade structures or planting areas. This freed the homeowner to develop his structures around the water (rather than the opposite sort of process in which watershapers typically engage), making it seem as though the water had always been there and the structures had been added. Steve Sandalis is founder and president of Mystic Water Gardens, an Encino, Calif.-based designer and installer of custom streams, waterfalls and ponds. Sandalis founded the firm in 2000 after several years of pursuing watergardening as a serious hobby. Since then, he has immersed himself in arts and crafts of watershaping and currently designs and installs highly detailed watershapes for a range of mostly residential customers across the United States. A former model and actor, Sandalis appeared on more than 700 covers of romance novels published by Topaz, a division of Penguin Books, and has appeared in a variety of movies, television programs and commercials. A native of Commack, N.Y., he began working in the construction trades as a child with his father and uncles – all of them contractors in the area.